Maldonado is divided into three economic centres which maximize the natural resources provided by three corresponding geostructural regions. The northern and central region, with its sierras and hills, is home to the department’s livestock raising and mining industries. This region has the Sierra Carapé, a mountain range with Uruguay’s highest point: Cerro Catedral. The urban centre of the region is Barrio Aigua. The western region—with its main city, Pan de Azúcar—is characterized by plains and fields of wheat, corn, sunflowers and potatoes. The southern coast strip, with its beautiful beaches, is centred on the metropolitan area of Piriápolis. 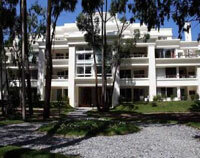 It is also here where the affluent beach neighborhoods of Punta del Este and San Carlos are. Fishing and tourism are the main industries here. The Laguna del Sauce International Airport is in Maldonado. 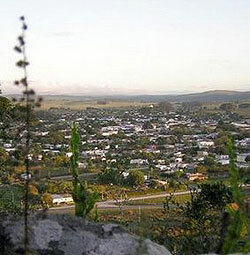 Maldonado City, situated 120 kilometres away from Montevideo, is the capital of the department of the same name. Its main appeal lies in its many historical sites dating back to Spanish colonial times, which have been carefully restored and preserved. One example is the San Fernando de Maldonado Cathedral. Built in 1801 in the Neoclassical style, it is especially famous for two religious images. The first is the Virgen del Carmen, which was recovered from the shipwreck of the steamship Ciudad del Santander in 1829. The image of the Virgin is placed on a faithful scale model of the steamship. The second is the Cristo Agonizante, a gruesome image of the suffering Christ, found washed ashore on the city’s beaches and installed at the cathedral’s altar. Another popular site is the Cuartel de Dragones, 18th century military quarters where General José Gervasio Artigas was based. A few houses have been converted into museums. One of these is the Museum of American Art, boasting a collection of pre-Columbian and Latin American art. 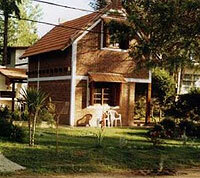 Another is the Azotea de Haedo, once the home of former Uruguayan president Eduardo Víctor Haedo. Known for his cultural initiatives, including the enactment of the country’s copyright law, Haedo’s residence remains a meeting place for artists and writers, and a repository of their works. Visitors who need a rest from all the sightseeing could do so at the city’s historical parks and squares, such as the Plaza San Fernando de Maldonado, with its lavish mural, La Diligencia by renowned Uruguayan painter Castells Capurro, and the Plaza Torre del Vigía, with its 13-metre lookout tower where visitors can get panoramic views of the Río de la Plata. The beach resort town of Punta del Este, situated on a peninsula in the Maldonado Department, is the place where international jetsetters come to play. Its beaches are quite well-known: Playa Mansa, with its quiet waters; Playa Brava, on the other side of the peninsula, with its strong winds and rougher waves—and the Monumento al Ahogado (Monument to the Drowned), five giant stone fingers emerging from the sand intended by the sculptor to serve as a warning to swimmers; Playa El Emir, on the same side as Playa Brava and named after an emir who built a house near the shore; and Playa de los Ingleses, a small beach near the tip of the peninsula that is not considered safe for swimming. Much farther away from the peninsula is La Barra, the beach most visited by international celebrities. It is not surprising that in the area surrounding this beach are lavish seaside mansions, tree-lined streets and posh boutiques. At the tip of another small peninsula near Punta del Este is Punta Ballena. As its name indicates, it is the perfect place to watch whales. Sitting atop it is the Casa Pueblo, a sprawling, Mediterranean-style, surrealist home that has been called a living sculpture. This cuidadela-museum was built by artist Carlos Páez Vilaró and houses his paintings, sculptures and ceramics. Because of its popularity among the rich and famous, several upscale residential projects are being developed on Punta Ballena, including apartment complexes. The posh neighborhood of La Barra is famous for Bikini Beach, frequented by celebrities and bathing beauties. Because of its popularity among international jetsetters, a number of luxury hotels and resorts have risen in La Barra, including Hotel la Bluette, Las Dunas Hotel and Spa, the Mantra Resort, Spa and Casino, the Esturion de Montoya Deluxe Resort and Suites, and La Posta del Cangrejo. Piriápolis is often called the Monaco of Uruguay because of its resemblance to the Mediterranean nation, especially when looking toward Cerro de Antonio from the downtown area at night. Although not as busy as Punta del Este or La Barra, Piriápolis has beautiful beaches that draw visitors and holidaymakers. The city’s waterfront promenade, Rambla de los Argentinos, runs along the coast and is lined with elegant hotels, restaurants and cafés. Cerro Pan de Azúcar, Uruguay’s third highest peak and a natural reserve, looms over the city. Piriápolis offers many real estate opportunities. Hillside properties have scenic beach views. There are also small neighborhoods that offer single family homes and real estate that is within the financial reach of retirees. The exclusive neighborhood of San Antonio Hills is in one of the most picturesque spots on the Uruguayan coast. You can get there via an access road built in the shape of an ascending spiral. Characteristics that have made San Antonio Hills appealing to property buyers are its hilltop panoramic views of the sea and its proximity to the spectacular beaches of Piriápolis. Punta Fría is situated on an extension of a hill that points into the ocean at the borders of Cerro San Antonio. It has a beach, Playa San Francisco, and a number of excellent fishing spots. Many of the properties available in this area accord scenic views of the seaside boulevard, nearby Cerro San Antonio and Cerro Indio, and Punta Colorada.